The September sky, 2012 offered a few nights of good seeing from about 0130 to sunup. My nighttime astrophotography efforts have yet to produce images suitable for prime time viewing, so I have included a few drawings to illustrate some of the sightings. The photo of the Pleiades at the top of the page was captured by Robert Gendler, and has appeared as the NASA astronomy picture of the day ( APOD ). Yes, I have permission from Robert to use his photo on my blog. Robert has an interesting website where you can view and/or purchase his photos. Some of our September sightings are listed below. The Pleiades rose about midnight. Good eyeball view, and beautiful in the finder ‘scope. With our five inch telescope, it was possible to get “up close and personal” within the cluster, but my attempts to capture a good image of the Pleiades using the ‘scope as a telephoto lens were unsuccessful. I was, however, able to capture one photo, below, using only the Canon 55mm – 250mm telephoto lens. Of course, all the stars appear as points of light, and the nebula surrounding the stars were not visible using the Canon lens. I must do a bit of homework and learn how to do better nighttime photography in order to capture good images of nebula and other colorful objects. 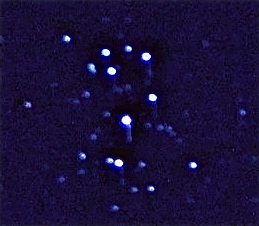 Twin open clusters between Cassiopeia and Perseus ( perhaps, not sure about these sightings ). 01: 00 Jupiter and the four Galilean moons rising. The other moons of Jupiter are beyond the capability of our ‘scope. Was unable to capture a good photo, but here’s a drawing to illustrate ( approximately ) what I saw . . . In case you don’t know, but always wanted to . . .
Jupiter has a total of 73 known moons, 50 that have been named, and 23 that are designated simply as J1, J2, J3 . . .etc. Most of the smaller moons are visible only with the largest telescopes. I do my drawings on an old IBM “thinkPad” laptop PC, then transfer them to my Mac to be posted. Why don’t I do the drawings on the Mac ?? ( You might want to know. ) Simply because I don’t know how to do drawings on the Mac, and I’m too lazy to climb yet another learning curve. There is something very special about seeing things like the Orion nebula and / or the Pleiades in one’s own telescope, even though much better images are readily available on the internet as well as hard copy. 04: 00 Venus rising – about ¾ in sunlight. Also, checked out Procyon, and Sirius. Viewing single stars – even the brighter ones – is actually kinda boring because they appear only as points of light. Of course, with the ‘scope many more of them appear than with eyeball viewing. 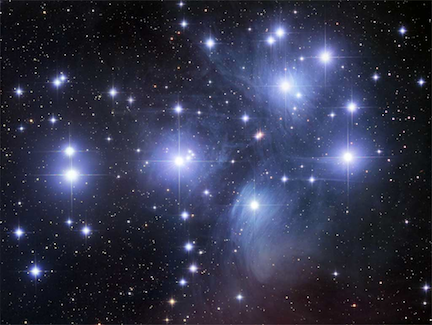 Star clusters such as the Pleiades, on the other hand, are much more interesting things to view with the telescope. Ring Nebula, M57, in Lyra and Double-double star in Lyra, labeled epsilon. Andromeda Galaxy ( perhaps – not sure of this sighting ). Venus rising, about ½ full phase. Not sure of phase – seeing not good tonight. Jupiter and Galilean moons clearly visible with good seeing. Two of the belts around Jupiter clearly visible with left eye, not visible with right eye. Cheapie eye test ! I have found that it is better to NOT use my glasses when viewing through either the spotter ‘scope or the “Big” ‘scope. 01: 30 Pleiades spectacular in both the spotter ‘scope and the Orion “Apex”. 01: 45 Jupiter and three of the four Galilean moons clearly visible, as well as 2 of the dark bands around Jupiter. 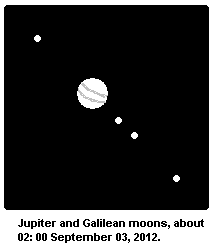 The 4th moon must have been hidden in the glare from Jupiter, or on the ‘other’ side of Jupiter where it could not be seen. 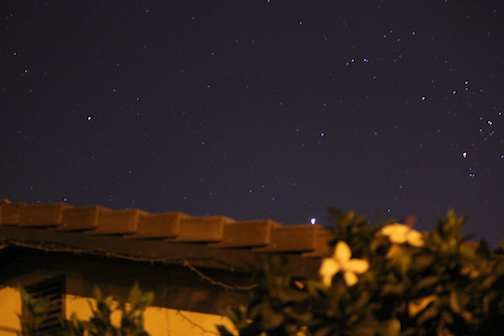 02: 10 Good sighting of red Betelgeus with Orion rising. 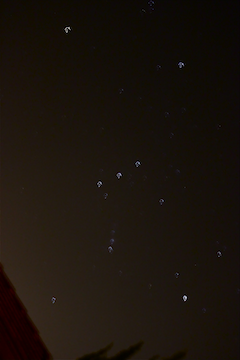 Was able to capture an image of Orion using just the camera, unattached to the telescope. For reasons that are not at all clear to me, Betelgeus ( upper left-hand corner of the photo ) shows no red tinge at all in the photo – it appeared about as red as does Mars in the eyepiece of the telescope. Alert readers, such as yourself, can see that the photo is a bit out of focus – perhaps that is why the red did not appear. The East Patio Observatory had not yet been set up, so all photo attempts with the camera were hand-held – – not a good way to capture pictures of the night sky ! Also found double star, Mintaka, and a Quad stars, labeled sigma on the star chart. The Orion Nebula, M42, was clearly visible with the telescope, but could not find the 4-star group in the middle of the Orion nebula – don’t know why these stars did not show up because viewing of everything else was pretty good tonight. Could not find the triple star named beta, to the left of Orion on the star chart. Venus appeared to be about half-full tonight. Tried out the East Patio Observatory set-up for the first time in the early morning hours, with limited success. 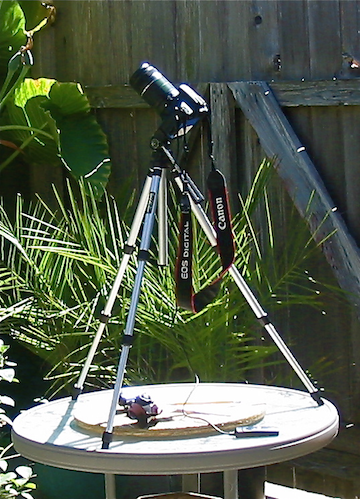 This set-up is for the camera only, using a small tripod atop the patio table. One of the problems with this location for an observatory set-up is that the Eastern Horizon ( our next door neighbor’s rooftop )is very close, as shown below. This eastern horizon situation means that everything “rises” about a couple of hours later than with the true horizon. Otherwise, the seeing was good this morning and it was well worth the wait to catch the Pleiades and Jupiter coming over the rooftop. Conditions were not good for star-gazing during the remainder of the month, so we enjoyed sleeping through the wee hours of the morning. Hoping for better conditions during October . . . . . This entry was posted in Astronomy and tagged astrophotography, Galilean moons, Jupiter, moons of Jupiter, Orion Nebula, pleiades, venus. Bookmark the permalink.